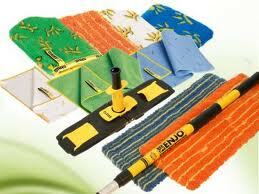 Clean mechanically instead of chemically with Enjo’s fibers. Have an eco friendly home. Enjo uses patented fiber technology and just water to remove up to 100% of all bacteria on surfaces. Save money and time while protecting natural resources with waste reduction and eliminating up to 90% of your household chemicals. Our products are made to last 2-3years and are completely recyclable. Enjo is an ISO certified company and has been given HACCP certification along with many other awards and certifications. Hard to believe…..easy to use! I personally love their Enjo-eco friendly products. I bought a set of cleaning fibers 5-6 years ago and I still use them today. The hardest thing for me to clean is the stove with all the grease, specially the stove hood and the only thing I use to clean it is my Enjo green glove. Just Enjo & water are all you need to clean your home. The fibers are washable and re-usable. If I sound like an advocate, that is because I’ve used the product. I don’t sell it but I’ve been a happy customer and I only bought these products once – 6 years ago.